“Hello, my name is Don and I am an absentee blogger”…”Hi Don”. Well, this issue of small barrels just won’t go away, and I think it will be with us to stay. I certainly hope the debate around it dies down, however, but the gist of the argument is this, Small barrels can age whiskey quicker than large because the smaller the whiskey volume to wood ratio is, the more whiskey is affected by the wood, thus it can age quicker. Seems pretty simple, but some of the purists are saying that there is no replacement for time in wood. There is some merit there as well as I discussed about a year ago here. I thought I would step in here as I am the CEO of the Thousand Oaks Barrel Co. We sell 1 liter to 15 gallon barrels all over the world and work with both major distilleries and most micro-distilleries using accelerated aging (small) barrels for commercial use as well as with packaged products i.e. 2 liter barrel with 2 bottles of white dog. Yes… those are my barrels. After reading the posts I will chime in with some information. First, if anyone is interested in getting the facts on accelerated aging barrels you can turn to a book put out by the Independant Stave Co. The book is the definitive resource on barrel aging and clearly describes in scientific terms exactly what is happening between the oak, the spirit and time. It is true that time (many years) gives a level of complexity to spirits that cannot be achieved in weeks. It is also true that an average pallet, would have a hard time identifing these complexities. It is also true that “many” of the micro-distilleries that have won top awards in the past 2 years have aged their spirits in 5, 10 and 15 gallon barrels for in most cases less than 2 years. To say that aging in small barrels does not work, simply is an untrue statement. In addition, the consumers purchasing small (1-5 liter) barrels and aging spirits at home love the final product and connect with the brand whos spirit they are aging. 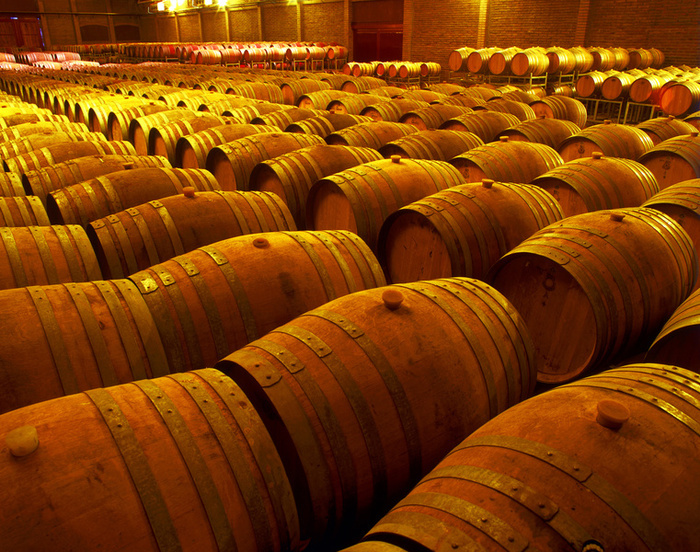 Quite simply put, small barrels create a great spirit and a happy loyal consumer. Personally, I’m excited about small barrels and the differences they can bring to the party. One day I will purchase one to do a re-aging project and see some of those differences myself, but in the meantime I think that it is great that artisan distillers are experimenting, and that many of us are the beneficiaries of those experiments. If you have any question about the difference small changes in wood aging can make, I have an experiment for you. Get a bottle of Maker’s Mark, and a bottle of Makers 46. Do a side by side comparison of the two. The only difference between them is the Maker’s 46 has between 6 to 12 weeks extra aging with some French Oak staves added to the barrel at the end of the aging process. To me the difference is profound. In my opinion Maker’s 46 is a far superior, and the only difference is a bit of time and some different oak. I think the possibilities are endless for what artisan and macro distillers can do to whiskey with a new philosophy on barrel aging. What do you think? Can small barrels make a big difference? Tags: featured, Small Barrel debate rages on! So you mean to tell me with this time absent, all you’ve been thinking about is getting your hands on some wood. Something doesnt make sense here. I found it under a stack of employment applications. good read don, but makers 46 is aged the same as regular makers and in the same barrels. the difference is after 3 years (or maybe they said two) the bourbon is then put into another barrel that has 46 french oak staves in it. those staves are also virgin wood (pretty sure), they haven’t been charred like the rest of the regular barrel. ^ also it is then aged for another year on that barrel. Actually it isn’t for another year, and the barrel the whiskey came out of is then retrofitted with No. 46 French Oak staves (you are correct about it being virgin wood) and then aged for only about 2-3 months more. It is hard to know exactly because they use tasting, not any hard and fast rules for time before they dump the batch and bottle it. Either way is is the introduction of that new wood that makes all the difference in flavor. And what a difference it is! 46 is fantastic stuff. I was told 9 months to a year at the distillery. I love it, it has much more vanilla notes then any bourbon I’ve ever had. It is a great example of a side by side though, cheers. Here is a link to the post I did about this 2 years ago. I’m pretty sure the marketing materials I saw said weeks, but either way it is pretty amazing what 10 little staves can do the the flavor of whiskey. It sure appears that small barrels increase the surface area for ‘ageing’ which may have been a misnomer for all these years. It may not be age that is as critical as the interplay between American Oak staves and the product. This sure appears to be a win/win solution in that oak barrels are works of art in their own right. Just stack three small barrels on an oak stand next to the TV and breathe deep the righteous air they produce, while they serve as a display of your taste and wealth, who’s the victim here?